Q. Has LinkedIn changed something? I can no longer see who viewed my profile unless I upgrade to a premium account. A. Yes, LinkedIn has changed the rules in the “Select what others see when you’ve viewed their profile” application in the free (Basic) account. Previously, if you had selected the “Anonymous profile characteristics such as industry and title” setting when viewing other people’s profiles, you could see at least partial information when people visited your profile. Now the only setting that will allow you to see partial information with a free account is to select the option to display “Your name and headline (recommended)” when visiting other’s profiles. your name and headline when you visit other people’s profiles. Log into LinkedIn and click the triangle next to your name in the upper right corner of any page. To visit a select person’s profile anonymously (say an old boyfriend or evil ex-boss), simply visit your Settings page just prior to visiting the profile, choose to view profiles either with “Anonymous profile characteristics such as industry and title” or “You will be totally anonymous”, visit the profile and then return your settings back to the more public setting so you can continue to learn who has visited your profile. Should you upgrade to view all visitors to your profile? Well, you can upgrade to see more about your profile visitors, but it’s important to understand what you will be able to see … and what you still won’t see. You will be able to see a full list of who has viewed your profile, but you will only be able to view people’s names and information if they elected to set their settings to “Your name and headline (recommended). In other words, if they chose to visit anonymously or semi-anonymously (“with anonymous profile characteristics such as industry and title”), that’s how they will appear. Anonymous visitors will still remain anonymous even if you upgrade your LinkedIn account. 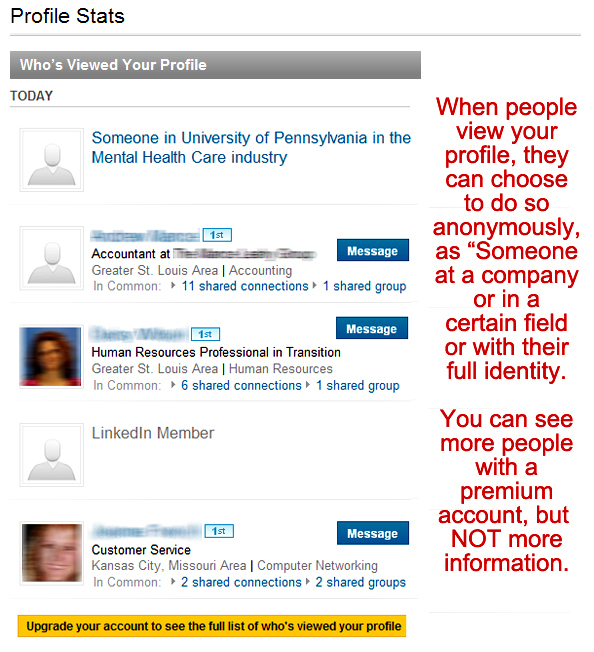 If someone does visit your profile semi-anonymously (“with anonymous profile characteristics such as industry and title”), you can click the live link that says something like “Someone in University of Pennsylvania in the Mental Health Care industry” and view a short list of possible people who may have visited your profile. One of the people listed will be your stealth visitor. When someone visits your page semi-anonymously, you can view a short list of possible visitors. Because you still won’t get full information about your profile visitors, I wouldn't recommend upgrading for that purpose alone, but if you are interested in the other benefits an upgraded LinkedIn account may provide, it may be a nice benefit to you. 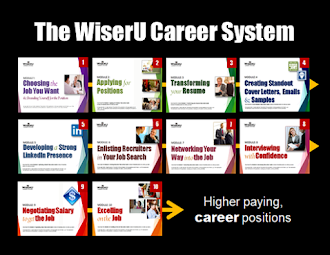 Change your settings to learn if a hiring company representative has visited your profile … it can help you … Get a Job!